Each module or group of modules meets standards for interface such as rail location, height and electrical connections so that each can connect with another. Each module or group of modules is six feet long or a multiple of six feet, such as twelve or eighteen feet. 2018 upcoming change: the electrical connectors shown in the specs will change to a modern and more reliable style. Info will be posted when the details of the changeover are finalized. Here is an example of one of the drawings in the specifications. 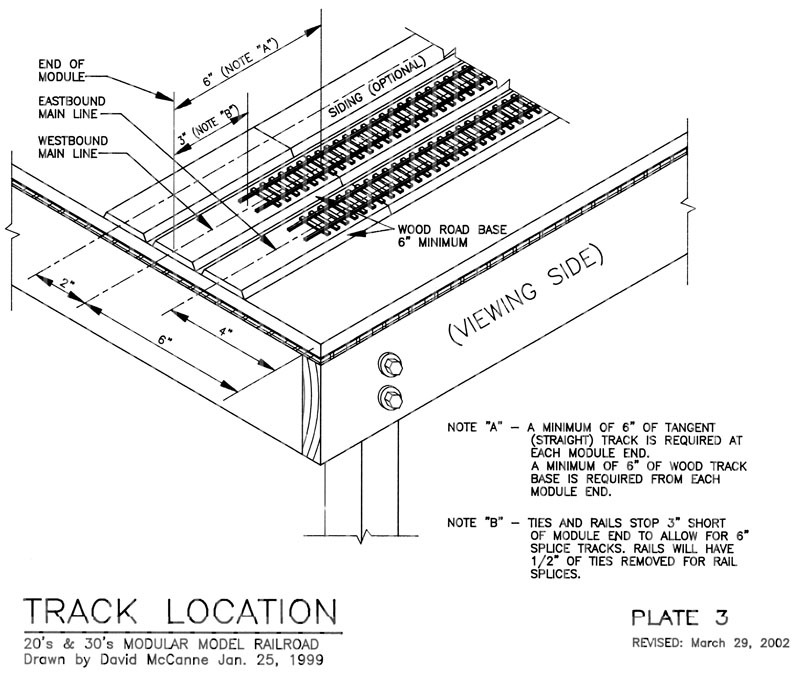 This shows the mainline track spacing from the front and ends of each module. If there is a problem seeing the pdf file, request the club's standards manual by clicking the "Contact us" link at the right. We'll send it to you as a .Zip file 1.6mB email attachment. Some minor updates, shown in red color, were made to the standards on March 9, 2017.